The Pilgrim Set is built in our workshop. The boy pilgrim is hand painted in a blue shirt, black pants, and a black hat. 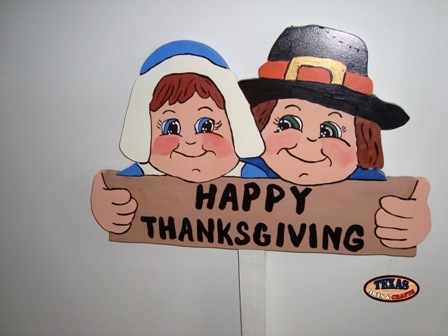 He is holding a sign that reads Happy Turkey Day. The girl pilgrim is painted in a blue dress with a white apron. 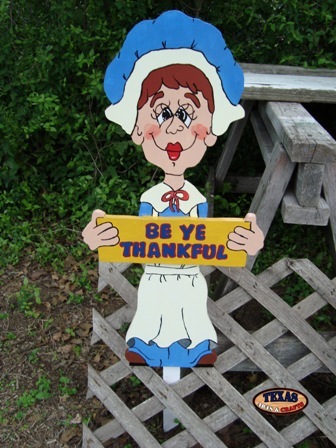 She is holding a sign that reads Be Ye Thankful. There is an orange pumpkin in between them. The dimensions for the boy pilgrim are approximately 35 inches tall by 13 inches wide by 1.50 inches deep. The arts and crafts yard sign has a 28 inch stake. The sign weighs approximately 2.50 pounds. The dimensions for the girl pilgrim are approximately 27.75 inches tall by 12.75 inches wide by 1.50 inches deep. The arts and crafts yard sign has a 28 inch stake. The sign weighs approximately 2.50 pounds. The dimensions for the pumpkin are 16 inches tall by 10 inches wide by 1.50 inches deep. The arts and crafts yard sign has a 17.50 inch stake. The sign weighs approximately 1.50 pounds. The signs have a combined weight of 9 pounds with packaging. For the continental U.S. shipping and handling is included in the listed price. For shipping outside the continental U.S. please contact us through our Contact Us page. The Boy Pilgrim is built in our workshop. The boy pilgrim is hand painted in a blue shirt, black pants, and a black hat. 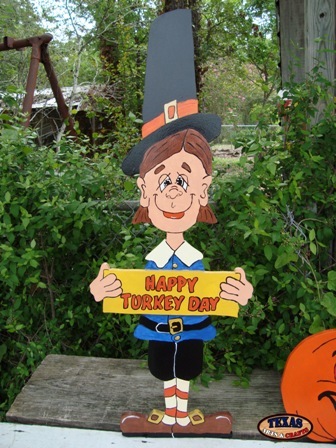 He is holding a sign that reads Happy Turkey Day. The dimensions for the boy pilgrim are approximately 35 inches tall by 13 inches wide by 1.50 inches deep. The arts and crafts yard sign has a 28 inch stake. The sign weighs approximately 3.50 pounds with packaging. For the continental U.S. shipping and handling is included in the listed price. For shipping outside the continental U.S. please contact us through our Contact Us page. The Girl Pilgrim is built in our workshop. The girl pilgrim is hand painted in a blue dress with a white apron. 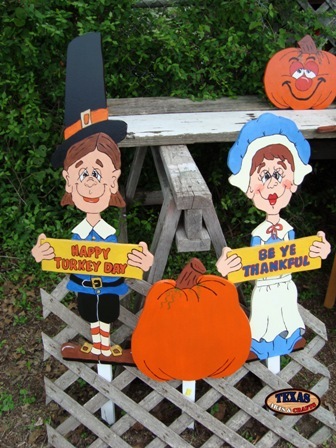 She is holding a sign that reads Be Ye Thankful. The dimensions for the girl pilgrim are approximately 27.75 inches tall by 12.75 inches wide by 1.50 inches deep. The arts and crafts yard sign has a 28 inch stake. The sign weighs approximately 3.50 pounds with packaging. For the continental U.S. shipping and handling is included in the listed price. For shipping outside the continental U.S. please contact us through our Contact Us page. The Small Pilgrim Couple is built in our workshop. 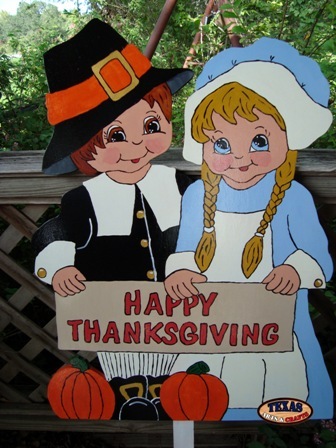 The girl pilgrim is hand painted in a white and blue hat. The boy pilgrim is hand painted in a black hat. 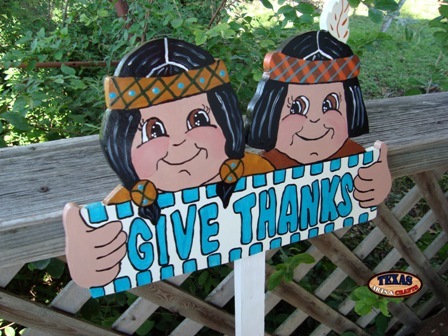 They are holding a sign that reads Happy Thanksgiving. The dimensions for the arts and crafts sign are approximately 11.25 inches tall by 18 inches wide by 1.50 inches deep. The arts and crafts yard sign has a 31.50 inch stake. The sign weighs approximately 4 pounds with packaging. For the continental U.S. shipping and handling is included in the listed price. For shipping outside the continental U.S. please contact us through our Contact Us page. 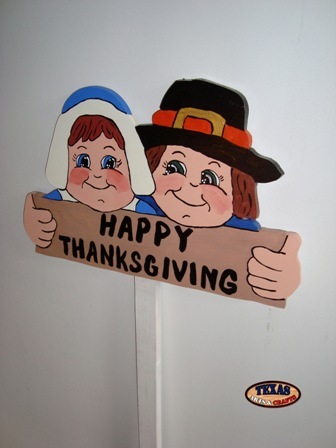 The Happy Thanksgiving Pilgrims sign is built in our workshop. The girl pilgrim is hand painted in a white and blue outfit. The boy pilgrim is hand painted in a black and white outfit. 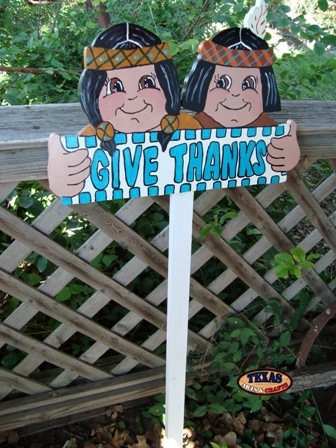 They are holding a sign that reads Happy Thanksgiving. The dimensions for the arts and crafts sign are approximately 30.50 inches tall by 22.50 inches wide by 1.50 inches deep. The arts and crafts yard sign has a 31 inch stake. The sign weighs approximately 8 pounds with packaging. For the continental U.S. shipping and handling is included in the listed price. For shipping outside the continental U.S. please contact us through our Contact Us page.